Discussion in 'Shops' started by Travis, Sep 17, 2013. 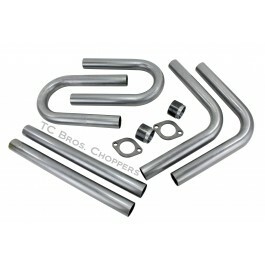 TC Bros Choppers is giving away one of their Yamaha XS650 Builder Exhaust Kits to one lucky member! To enter the drawing, just post in this thread! One entry per person (only the first post by each person in the thread will count). You must post before 11pm CST on 10/1/13 to qualify. The winner will be randomly chosen. Anyone is allowed to enter and shipping will be covered within the U.S. (customers located outside of the United States will need to cover shipping). Includes 2 straight length pieces. Tubing is 1.5 inch diameter 16 gauge mild steel and is bent on a 3" Centerline Radius. Flanges are 1/4 inch thick. Plenty of material is included to make just about any custom exhaust that you think of! Well hell, I'm in brother! All in for the kit. Im in like flynn. Need a custom exhaust. Tired of stock. Nice I need a new exhaust. My hack job is falling apart. was on here earlier and this just came up haha im definetly in tho ! Id love to get rid of the stockers - love your stuff...im in. yaaa!!! the people next door really need these!! One dark night in broad day light, two dead men got up to fight. Back to back they faced each other, drew the swords and shot each other. A deaf police man heard the noise and came and killed the two dead boys. OK, I am a newbie, but I am in. I'm in... bike just got back from paint and going back together, need an exhaust bad!! Count me in for the kit!